View of the Ocho Rios Bay from Turtle Beach Towers apartment rentals. Turtle Beach Apartments are housed within an apartment complex of four towers, overlooking a large swimming pool, in a secure, gated compound on the Ocho Rios Bay. It is not a resort. It is not a hotel. Our Turtle Beach Towers Apartments are good value private, self-catering accommodation. We offer studios, 1 bedroom and 2 bedroom apartments with balconies. Our Ocho Rios Apartments are unique, as they are individually owned. Every apartment has its own kitchen or kitchenette. Every Jamaica rentals apartment enjoys the services of a housekeeper. It's a vibrant community as many of the apartments are occupied by long-term tenants, a diverse community including families with children. We represent only QUALITY Ocho Rios Apartments seeking vacationers. - It should be noted that other agents offer apartments in this complex that do not meet our standards. - It should also be noted that some apartment owners offer their properties themselves and again there is no control over their standards. The pool area is the social centre of the Turtle Beach Towers apartment complex. The Ocho Rios beach showing proximity of the Turtle Beach Towers. Why choose Turtle Beach Towers for your vacation? Location! Location! Location! You won't find better than Turtle Beach for your Jamaica Rentals. There is a children's playground South of Tower 3. Great value for a clean and well-equipped apartment. A minute's walk from the white sand beach of Ocho Rios. Close to many world-famous attractions like Dunn's River Falls, swimming with dolphins, and much more. In walking distance of lots of restaurants, bars, nightlife, water sports attractions, shops and craft markets. Adequate secure parking on site. Choose an apartment at Turtle Beach Towers. View of Turtle Beach Towers and the Bay from the nearby hills overlooking Ocho Rios. 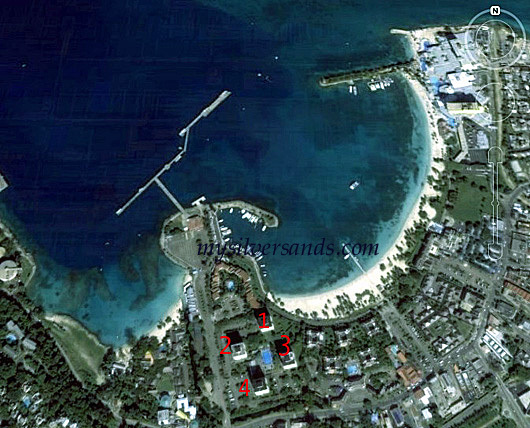 Below is a Google View of the Turtle Beach apartment complex, showing the towers, numbered 1, 2, 3, 4 in red, clustered around the swimming pool, and its proximity to the gorgeous crescent-shaped Ocho Rios beach. "I had the pleasure of staying for 1 week at Turtle Beach Towers. Oh boy, was that ever an enjoyable experience. The room it self was set up like a ray of sunlight, with the floral colors and specialty design tapestry. I have been coming to Jamaica since 1974 (a veteran-smile), but this is the first furnished room that I have visited in Jamaica and it was so complete with all the trimmings, that one could want. Including wine glasses, everyday glasses, meat choppin boards, placemats, strainers, iron & board, extra blankets and pillows (for that 'just in case') time!!etc. I mean there was not one utensil missing from the kitchen!! Who ever thought of designing the suite, possesses some genious ideas, of how one's home should look and they executed their job superbly!! I loved my visit 100%." Views from the apartments of Island Plaza and other nearby shopping centres. I spent a week in 3-1D with my wife and daughter. We had a great time in Jamaica and Turtle Beach Towers suited our purposes well and at a good price value when compared to the alternatives. However, I think it's important for people to know what to expect (or not to expect) from Turtle Beach Towers. First of all, it is not a resort and, by today's standards, is very basic. The property is somewhere around 50 years old. As a young boy, living in Jamaica, I first stayed here in the early 80's. It has not had any major renovations or upgrades in the 30 years since then. I mean that literally. It has merely been maintained and, while it is in decent shape, it definitely shows its age and is a bit on the run down side - clean, but a bit shabby. If you want to stay here, you should get your info directly from the MySilverSands website, as I found a lot of misinformation about this property on sites such as Trip Advisor and Expedia. The information published on most websites is simply incorrect. There is no free Wifi on the property and there is not a functioning restaurant/bar, which are two of the commonly published inaccuracies. There is also not a children's playground as claimed on some sites. To be fair, I do not see this misinformation on the actual MySilverSands booking website, but on the property itself there are, in fact, signs stating that there is a restaurant. There's not. They should change the signs. The pool and the playground. Apartment 3-1D itself is in decent enough shape. There are a couple of badly patched and unpainted spots on the walls, but it was clean when we arrived and was kept very clean and tidy by our housekeeper (who we did not have the opportunity to meet in person). Two wall mounted A/C units and a couple of small, portable fans kept the temperature fairly nice during our stay, but it is not actually central air like MySilverSands claims and, be warned, the housekeeper turns off the air during the day when they come to clean. You may come back to a muggy room and have to wait for it to cool back off. The kitchen is listed as being well-equipped. That may be a bit of an exaggeration, but it is adequately equipped, unless you plan to do extensive cooking during your visit. The dishes and pots/pans are sufficient for general purposes and there's a small coffee pot, microwave and toaster, in addition to the stove and fridge. Most of the cabinets had issues with the doors and hinges being loose, unattached or just in bad shape, but the kitchen was certainly good enough to get by for a week. The living room has an older, medium sized tube TV with cable. There is not a TV in the bedroom as the apartment listing claims. Also, there is not a CD player in the living room. Actually, there is a big, old school boom box that was taking up most of the space on one of the bed side tables in the bedroom. One weird thing is that on one of the tables in the living room, there is a WiFi router, plugged in, lights flashing and all...but both the person on the phone with MySilverSands and the people at the front desk of Turtle Beach Towers repeated to me that there was no Wifi available in this apartment. Well, if they don't want people using the Wifi that clearly does exist in the room, it seems like they would stick the router in a closet or something, instead of pretending they don't have it. They do have it; they just won't let you use it. The location of the property is great. You are in walking distance of most of the shopping in Ocho Rios. You're across the street from Island Village and Margaritaville (the only place nearby with free Wifi) and just around the corner from the Taj Mahal shopping center. A fairly short stroll toward downtown gets you to more souvenir shops and the craft market. If you have a rental car like we did, it's a quick ride to good supermarkets and a variety of more non-tourist oriented businesses. Tower 2 (above left) with cruise ships docked in the bay and every building has a lobby (above right). The swimming pool is clean and extra large. There is a lifeguard on duty most of the time, but much of the time, they really aren't paying much attention to what's going on in the pool. I never saw any of them actually using the raised lifeguard chair and, quite often, they weren't even sitting where they could see the people swimming. I guess if you screamed, they would come see what was going on. So, if you have children, you may not want to leave them unattended, assuming the lifeguard is looking out for their safety. They may or may not even be in view. Like I said, the pool itself is pretty clean and nice, but the lounge furniture is a mess. Most of the chairs are in shabby condition and many are just ragged (the same is true for the ones at the beach). The poolside tables have seen better days, as well. A couple of them had glass mosaic tops, which were in varying states of disrepair. This is something you want to watch out for, because the chipped and broken glass mosaic pieces can end up on the ground. I know, because I cut my toe on one while sitting barefoot on one of the ragged lounge chairs. Again, I'm just pointing out the bad with the good. We spent time at the pool every day and it was fun and refreshing, but nothing fancy. Turtle Beach Towers is a fenced property. There is a security guard manning the drive-in gate and another one at the walk-in gate that leads to the beach. Physical security is actually my industry and the security at this property was not up to the standards I require of my own employees, but it was at least some level of security. There was supposed to be a change in security companies right after we left, so maybe they'll do a better job, but really there's not a lot to worry about. Despite the sub-par security guards, there's no reason to not feel safe. A lot of people live in these apartments full time and the grounds are safe enough that there are children playing freely outside at all hours. This was the first time being in Jamaica for my wife and daughter and they felt perfectly safe and comfortable at this property. As long as you have realistic expectations of the property, I would recommend Turtle Beach Towers, particularly to anyone that wants a more "local" experience than you will get in a big resort. Despite it's shortcomings (which, on the whole, really aren't that bad), I think this is one of the better dollar values on the north coast of Jamaica. If I stay in Ocho Rios on my next visit, I'm sure I'll choose Turtle Beach Towers again. If you're picky, though, I doubt this is the place for you, but none of the things I listed that would be taken as negative were really so bad, individually or on the the whole, that I would consider them deal breakers. Find out more about Ocho Rios.